This post is part of an ongoing series about creative, on the ground water solutions in California. When it comes to building restored natural rivers, or building “rivers” of new water supply, the Golden State is a laboratory for innovative water management. The Yolo Bypass is one of those seemingly rare, beautiful cases where agricultural, environmental and urban interests work together. Although there’s nothing new about the Bypass (the Sacramento River flood management project was approved by Congress in 1917), its elegant simplicity can serve as a model for smart, economical flood management well into the future. 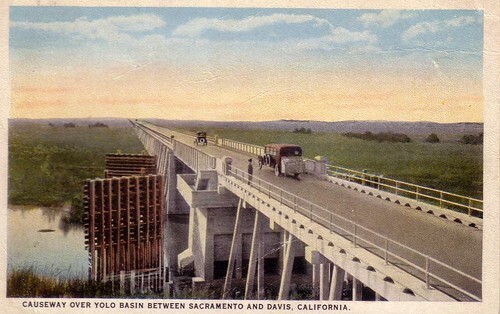 If you have ever driven over I-80 between Davis and Sacramento, you’ve passed over the Yolo Bypass. The Bypass is a surprisingly large resource, comprising 59,000 acres. It floods in over half of water years. When fully inundated, the floodplain approximately doubles the wetted area of the Sacramento-San Joaquin Delta and is one-third the size of the San Francisco and San Pablo Bays. From a flood management standpoint the project is a real success story. The Yolo Bypass is capable of conveying up to 80% of the flow of the Sacramento River Basin in high flood events, and the design capacity has never been exceeded. The Bypass has succeeded in proving not only that flood management, environmental and agricultural interests can co-exist, but that they can be complimentary. Unlike traditional levee-based flood management systems that narrowly confine and isolate rivers from adjacent floodplains, the Yolo Bypass allows the Sacramento River system to reap the floodplain’s ecological benefits. The floodplain habitat created during inundation provides prime real estate for fish, fowl and other wildlife. Migratory birds including swans, ibis, geese and ducks use the Bypass as a place to rest and refuel during their long journeys. Other users of the Yolo Bypass are the millions of young salmon migrating from their natal streams in the mountains down to the sea and other native fish. This seasonal floodplain provides critical, high-quality habitat for over 40 fish species, including the listed Delta smelt, steelhead trout, and spring-run and winter-run Chinook salmon. Research has shown that salmon growth rates and habitat and fish diversity in the Yolo Bypass are substantially higher than in the adjacent Sacramento River, indicating that the Bypass provides better habitat than the mainstem. When dry, the Bypass’s rich soils provide fertile cropland for tomatoes, safflower, sugar beets, rice, corn, and other grains. Approximately 2/3 of the land in the Bypass serves as seasonal, privately owned farmland. The State Reclamation Board owns flood easements that allow private farmland in the Bypass to be flooded when necessary. The Bypass is also home to the Yolo Bypass Wildlife Area - a 16,000 acre area that is managed for wildlife benefits through restored grasslands, seasonal and permanent wetlands, riparian woodland and carefully managed agriculture. Along with environmental benefits, the Wildlife Area provides educational and recreational opportunities for surrounding communities. The Bypass offers us multiple lessons today. With our fisheries in a state of collapse, many biologists, environmentalists and water leaders are exploring opportunities to further increase fish habitat in the Bypass – providing more environmental benefits in more years. We are also working with the South Delta Water Agency and others to develop a plan for a similar, smaller bypass in the South Delta. Like the Yolo Bypass, the creation of a South Delta Bypass would provide flood protection while benefiting local fish species – particularly young salmon. And finally, the state’s FloodSAFE California program provides an opportunity to apply the lessons learned in the Yolo Bypass to provide improved flood protection and environmental benefits throughout the Central Valley and the Delta. Innovative water solutions don’t always have to be new. Sometimes innovation lies in rediscovering proven, century-old infrastructure that is hiding in plain sight.